The current incarnation of Industry City, Sunset Park’s manufacturing and technology hub, may have taken root in 2013, but some tenants of the complex have been there longer than that. 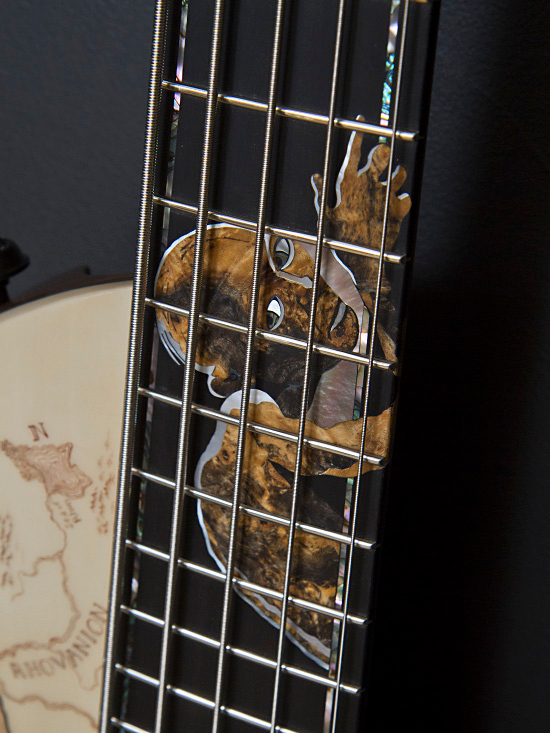 In the case of Fodera Guitars, a boutique maker of custom basses and guitars, much MUCH longer. Having moved into their space in 1989, Fodera is one of the oldest (if not the oldest) tenants in residence at Industry City. 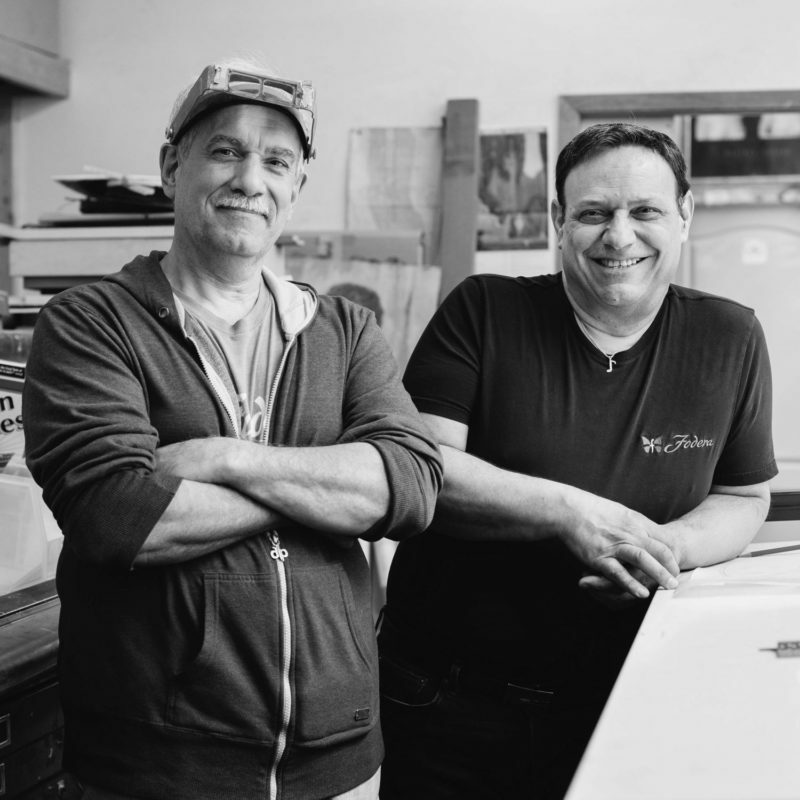 The company was founded in 1983 by Vinny Fodera, a skilled custom guitar builder (luthier), and Joey Lauricella, a professional bass player. 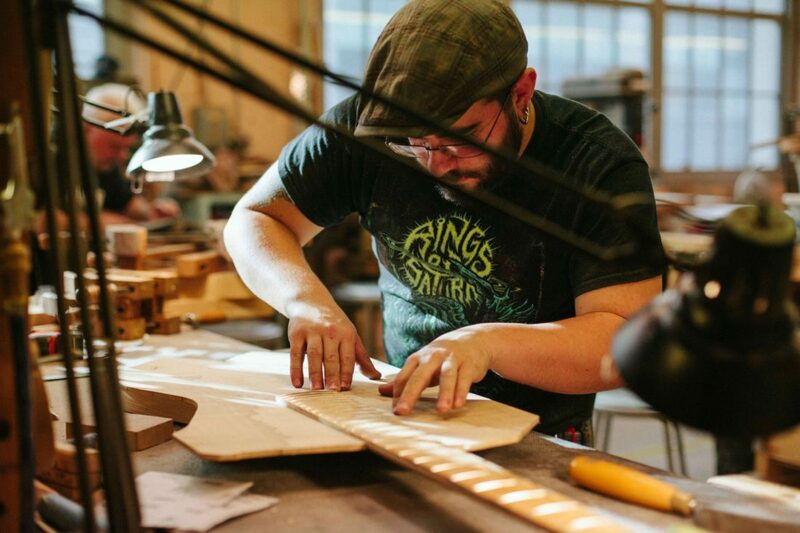 To this day, both men have a hand in every guitar that leaves the shop with Vinny primarily responsible for overseeing design and Joey for installing electronics. Vinny’s daughter, Laura, has also been working in the office for 8 years. The company furvery much has a family feel – both when it comes to actual family as well as employees and clients. When they first moved into what was then Bush Terminal, Fodera only occupied half of its current space. Since then, they’ve doubled the size of the shop and grown to 20 employees. Each year, they put out 350-400 instruments, although their size and product output isn’t how they measure growth. They measure it on the work and how far they can push themselves and their craft. 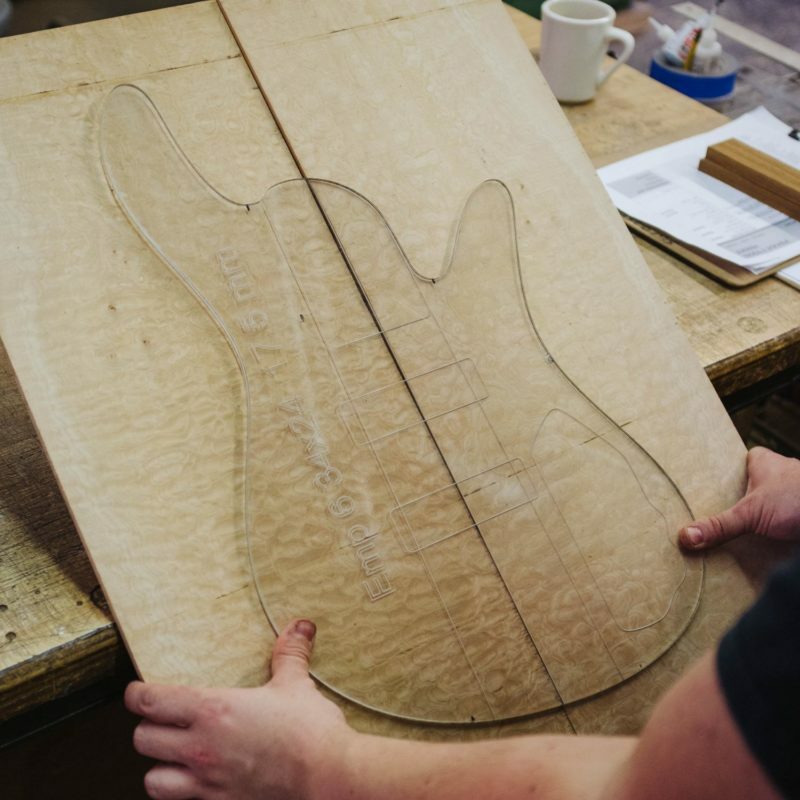 That’s why, along with completing their client orders, they set time aside for what they call “master builts.” These are guitars they make just to see if they can. Ideas come from whatever Vinny and other luthiers happen to be thinking about at any particular time. For example, Vinny is a wine enthusiast and so, at one point, they made a wine-inspired instrument. Other master builts have been inspired by Frank Lloyd Wright and incorporated intricate bird inlays. 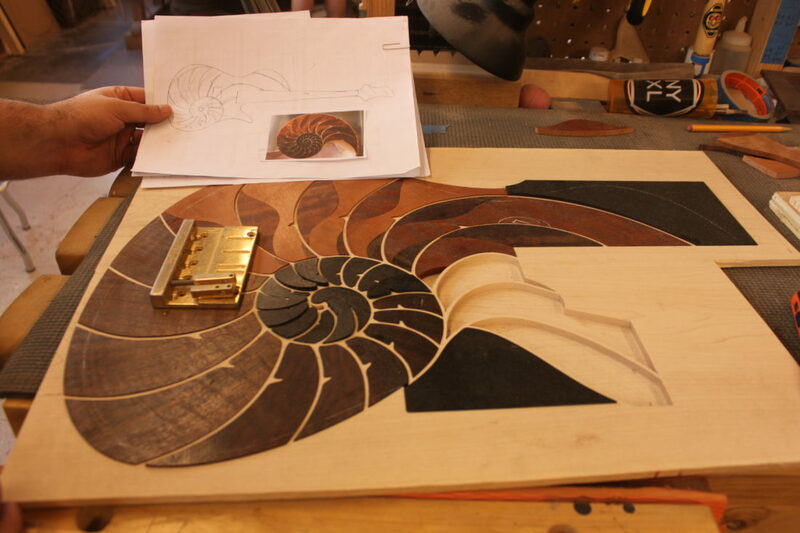 Right now, they’re working on a Nautilus-inspired master build. 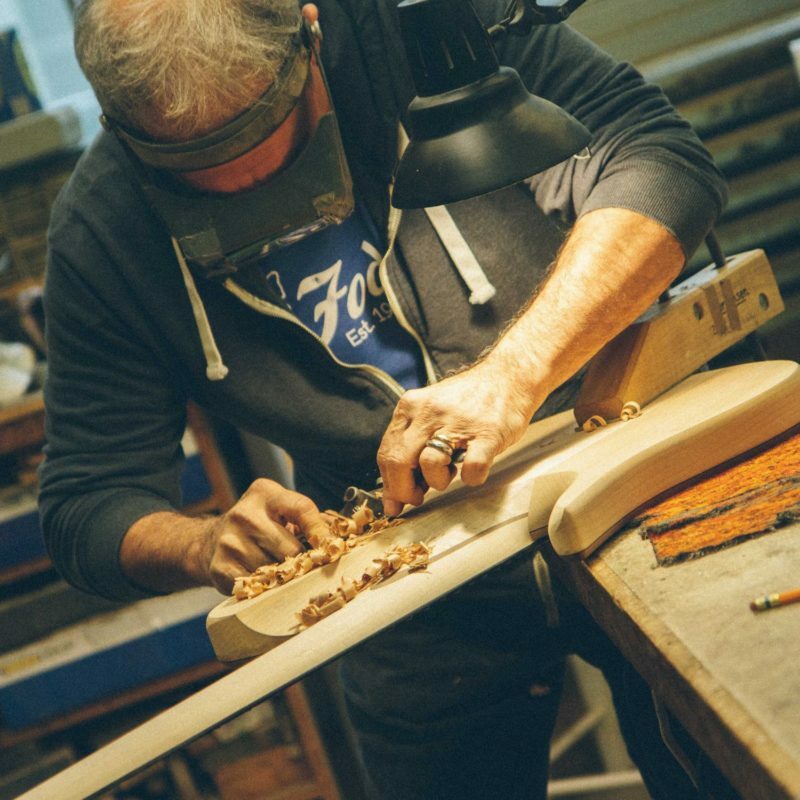 While they use the master builts to push the envelope a bit, they approach every instrument they make with the same level of craftsmanship and precision. There is even an art to the way they collect material for future use, as evidenced by their wood library. As opposed to the larger instrument manufacturers, they seek out older, higher-quality wood that hasn’t been subject to quick harvesting. The wood they have in their library is all higher than furniture grade and is chosen for its tonal properties. A lot of it is aethetically beautiful as well. 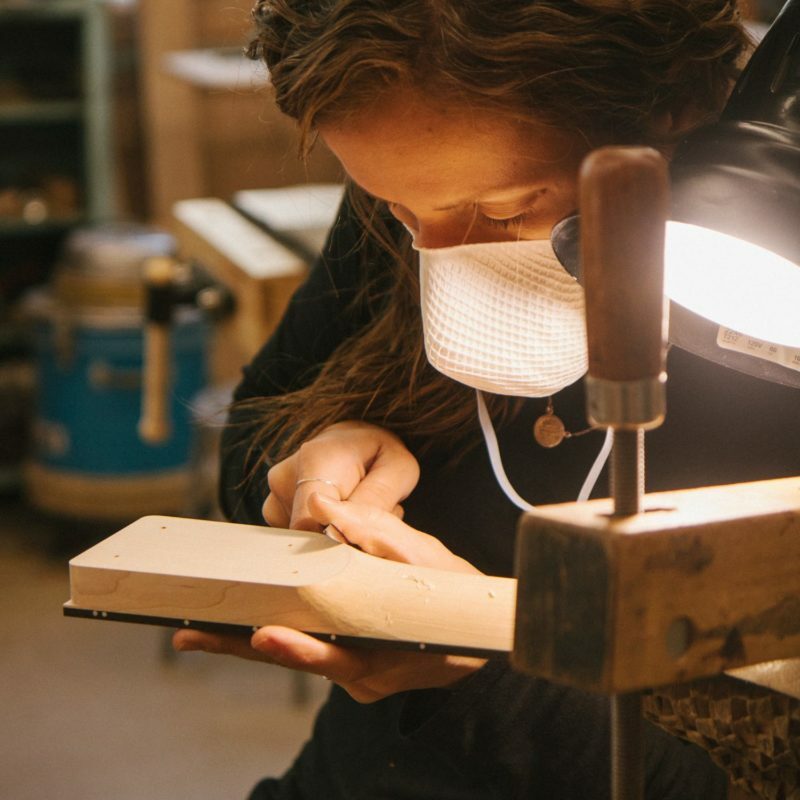 That’s especially important for giving clients a wide selection for their instrument’s top wood. All their instruments are made completely on site, including finishing, which they say is rare in the industry. 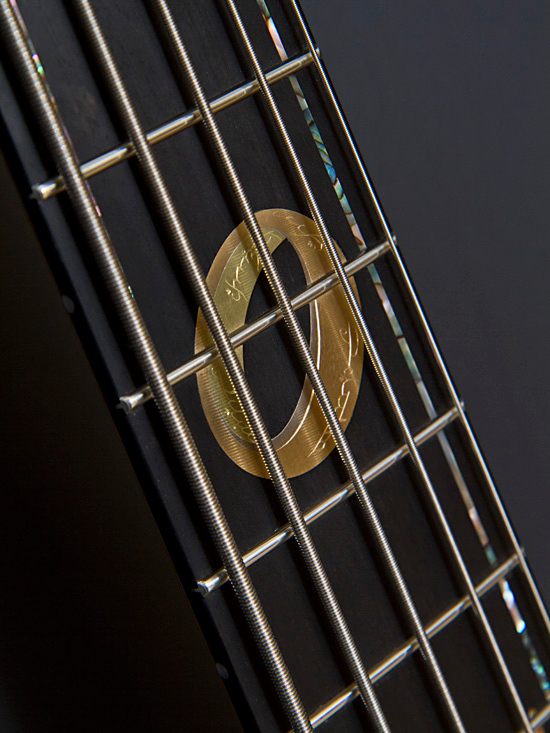 In fact, not only are the instruments themselves made in Brooklyn, but all their parts – with the exception of tuners and knobs – are manufactured in the U.S. 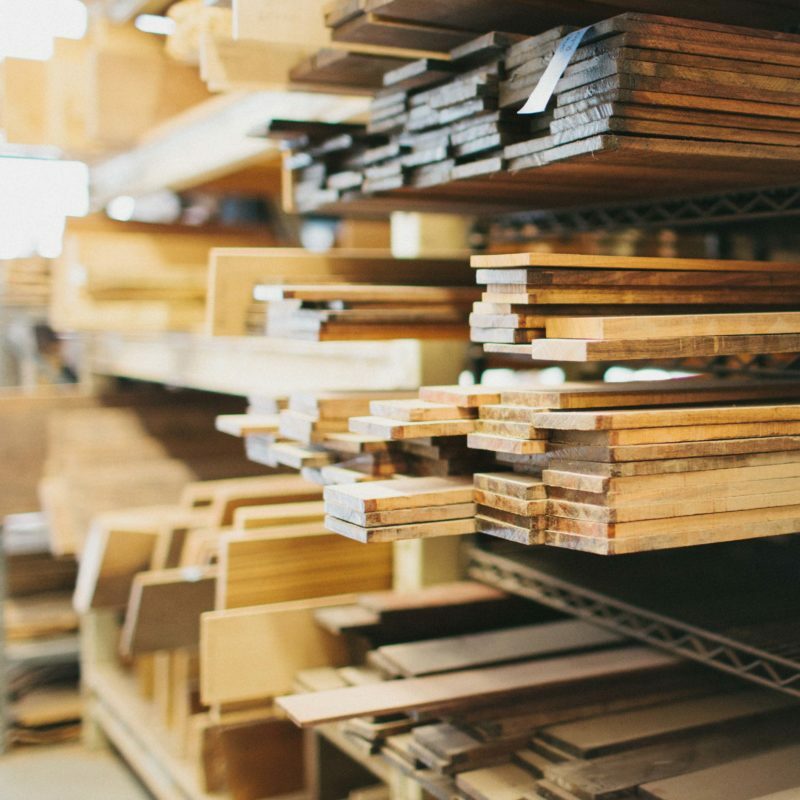 The process starts with a C & C machine cutting down bulk wood into workable pieces. Across industries, this machine is often used to do most of the product cutting, but for Fodera, each order is so unique and demands a certain level of customization that much of the work is done by hand. They use the C & C machine more like a router, doing generalized cutting. 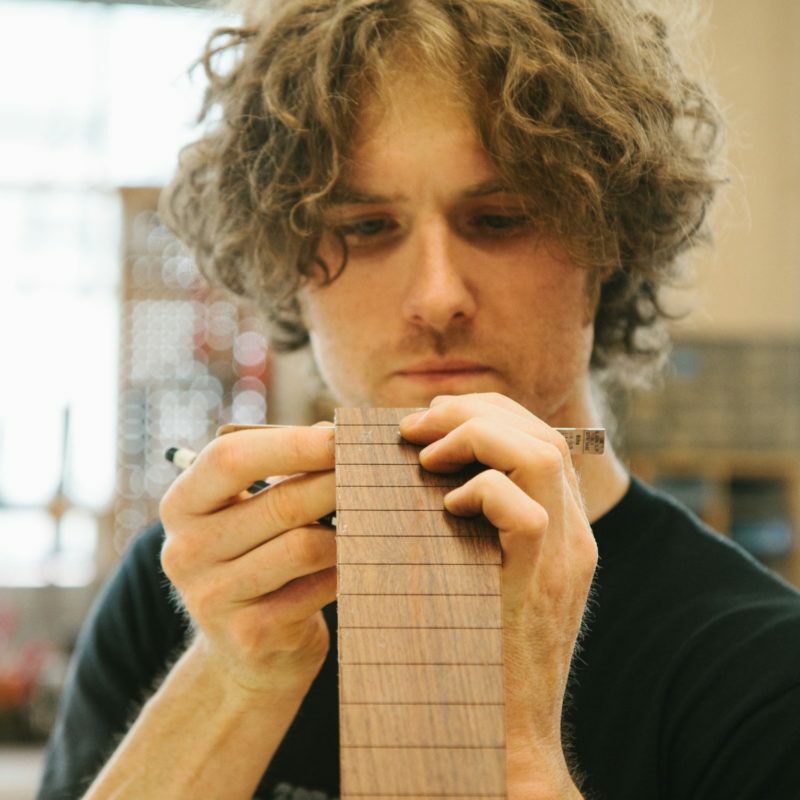 From there, Fodera’s craftspeople shape the various parts of the instrument to the client’s specifications. Those requests can get pretty specific. 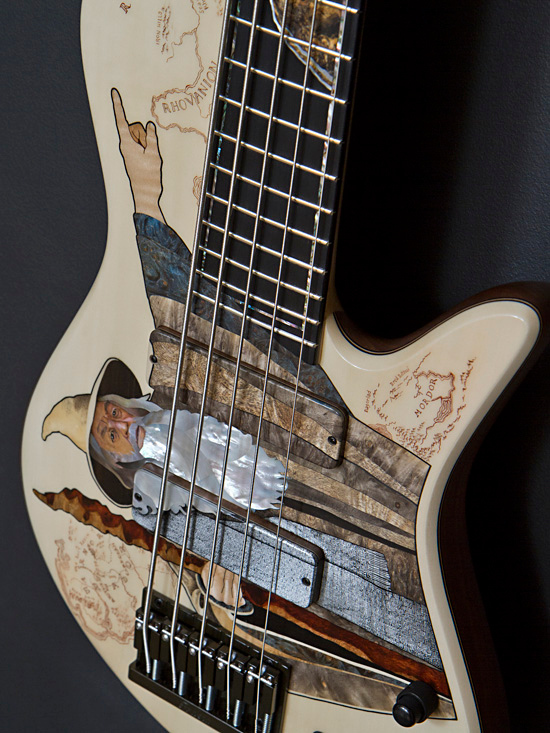 One order was for a Lord of the Rings-themed bass. They weren’t sure how they would pull it off and still make it a beautiful piece of art, but Vinny and Joey hardly ever say no to challenging projects. The result speaks for itself. Fodera’s longevity isn’t the only testament to their quality. Clients keep returning –both for new instruments and just to visit. Bassist Anthony Jackson is probably their longest-term client. Jackson famously played the bass line on The O’Jays’ For the Love of Money and has been a Fodera customer since the beginning. 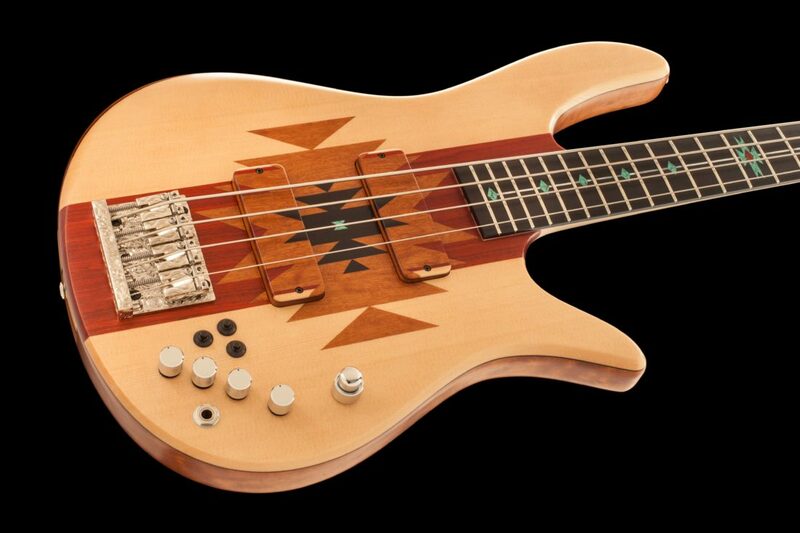 In total, he has 11 custom Foderas, including one master built, a six-string contrabass they labeled the Anthony Jackson Presentation Bass. And there are probably more Fodera basses in his future. Jason DeSalvo from Industry City on Vimeo. 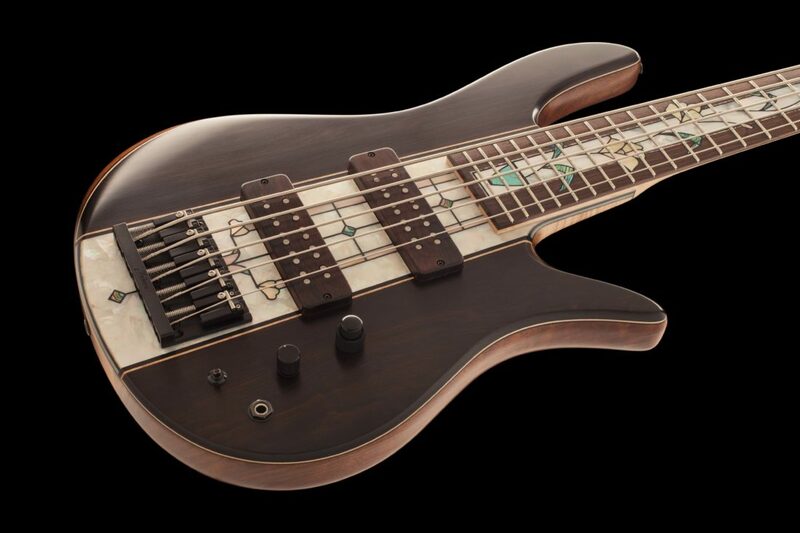 If you’re looking to pick up a Fodera, they’re well worth it but definitely an investment. But don’t let that stop you from coming by the shop to take a look. They love getting to know anyone who responds to what they do. This post was sponsored by Industry City. If you would like to reach our readers, please contact us.